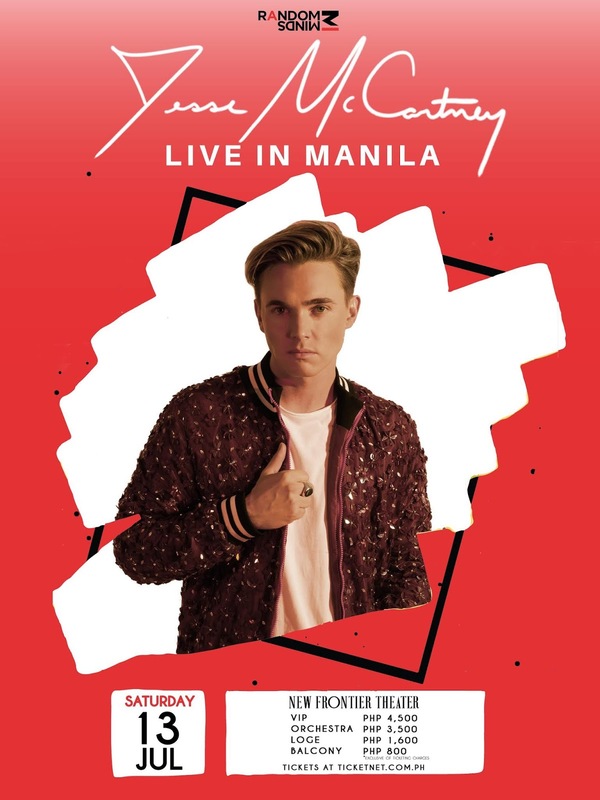 Critically acclaimed pop artist, Jesse McCartney is thrilled to announce his debut Manila show on July 13th at The New Frontier Theater. Tickets are on sale April 3rd at www.ticketnet.com.ph or call 911-5555 with the following ticket prices: VIP Php 4,500, Orchestra Php 3,500, Loge Php 1,600 and Balcony Php 800. Brought to you by Random Minds. Recently Jesse released his tongue-in-cheek music video for his single “Wasted.” CLICK HERE to watch exclusively on Rolling Stone. The video was directed by Jason Lester. Last year, he released “Better With You” his first music since his well-received 2014 album In Technicolor. “Better With You” premiered on Paper Magazine and reached #28 on the Spotify US Viral chart, #42 on the Global viral chart, and the official music video has almost 10 Million views. Also the song has been getting airplay with Elvis Duran/iHeart Radio and Sirius XM. The New York-born singer-songwriter, producer and actor has had the kind of career that most young artists aspire to. Since the beginning, McCartney has attracted a diehard fan base thanks to many things: his rhythmic, R&B-tinged pop-rock sound, his self-deprecating humor expressed through interviews and on social media, and his ability to write heartfelt, relatable songs that are both personal and universal. His recent music is no different. With multiple platinum-selling tracks and a songwriting credit on Leona Lewis’ “Bleeding Love” under his belt McCartney is ready to introduce his fans to who he is today. He plans to release more music throughout 2019 and bring his dedicated fans along for the ride.